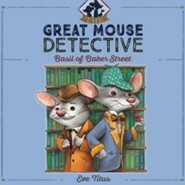 Basil, the famous sleuth of mousedom, lives in the cellar of Sherlock Holme. A devoted admirer of the great detective, Sherlock Holmes, Basil has learned his craft by listening at his feet. But will it be enough to help Basil solve his most baffling mystery yet? "The Mystery of the Missing Twins" is one of the strangest cases in Basil's career. With only a few crumbs of clues with which to find answers, how is he ever going to figure out where Angela and Agatha are being kept - and, of course, who mouse-napped them! 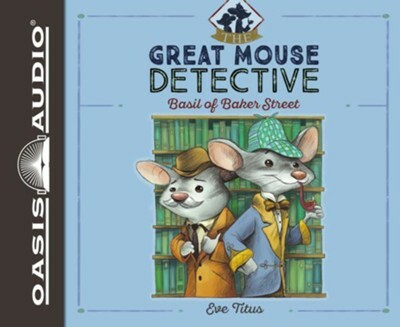 Will Basil's mouse sleuthing skills be up to the task of finding the twins before it's too late? Unabridged audio CD; approximately 2 hours; 2 CDs; read by Ralph Lister. Baker Street Mice  Beware! So far the twins are safe. Theyll stay that way if you do what we say. Weve decided to make your Baker Street cellar the headquarters for our gang. Everybody must be out in 48 hours. Its Basils job to move you all out, just the way he moved you in. Better make it fast! And leave the furniture  we need it. This is the only warning youll get. And listen  if you dont follow our orders, youll never set eyes on those twins again! Eve Titus (1908-2002) was the author of many childrens books, including those about the French cheese-tasting mouse Anatole. Of Basil of Baker Street, Adrian M. Conan Doyle wrote to the author, "It is simply a wonderful creation, and I can assure you that my father would have revelled in every page." 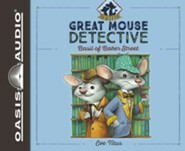 The book was also made into a Disney movie, The Great Mouse Detective, in 1986. Numerous Sherlockian collectors prize the Basil mysteries, which include Basil of Baker Street, Basil and the Cave of Cats (originally published as Basil and the Pygmy Cats), Basil in Mexico, Basil in the Wild West, and Basil and the Lost Colony. I'm the author/artist and I want to review Basil of Baker Street - unabridged audio book on CD #1.